May is a great month. Spring’s in full bloom (which isn’t entirely GOOD news for those of us with allergies), and it’s time to celebrate our very special Moms. There’s another tradition we celebrate in May. Having been deemed Mental Health Month it is the time we become more aware of mental health and mental illness. Mental illness is a big issue, and there’s still a lot of misinformation about it swirling in the air. For starters, the American Psychiatric Association defines mental illness as “any health condition involving changes in thinking, emotion or behavior (or a combination of these). Mental illness is associated with distress and/or problems functioning in social, work or family activities.” Still, the majority of people with mental illness continue to function in their daily lives despite their illness. Almost everyone is touched in some way by mental illness. The National Alliance on Mental Illness reports that approximately one in five American adults, or 43.8 million people, experiences mental illness in a given year. One in 25 has a serious mental illness, one that limits major life activities. Serious mental illnesses include diseases like major depression, bipolar disorder and schizophrenia. I’m not done. One in 12 people has a substance abuse disorder. Why are so many people affected by mental illness? 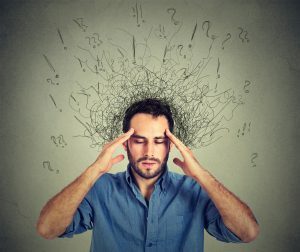 The exact cause of mental illness is unknown, but researchers have uncovered a few factors that may contribute to its formation. One is genetics. Many mental illnesses run in families, suggesting people inherit at least a susceptibility to developing a particular illness. An imbalance of brain chemicals called neurotransmitters have been linked to some types of mental illness as well. These chemicals help brain cells communicate with each other. If they can’t communicate properly because the chemicals are out of whack, clear messages can’t get through from the brain. Another contributing factor is psychological trauma such as severe physical, emotional or sexual abuse endured as a child, witnessing a traumatic event or experiencing significant loss. Environmental factors can also contribute. These include the death of someone close to you, a divorce or a big change in your life, like a new job. These factors often foster substance abuse. Whatever the cause, mental illness is just that, an ILLNESS, not a weakness in your character. Mental illness runs the gamut, from mild depression to psychotic schizophrenia. Each illness has its own set of symptoms, but I’m giving you a few general symptoms so you know what to watch out for, in yourself and others. These are some of the more common symptoms of mental illness in adults. For more, go to the American Psychiatric Association website. If you notice these symptoms and are willing to get help, consult a qualified psychiatrist or psychologist. They understand mental illness and can recommend the best course of treatment for you. If you ever feel like hurting yourself or others, call your local crisis hotline or 911. The treatment chosen is based on the type of mental illness you have and the severity of your symptoms. The most common methods of treatment are medication and psychotherapy, or a combination of both. There are other options that may be considered including hospitalization, day treatment, group therapy and specific therapy such as cognitive behavioral therapy. In most cases, treatment is effective, but you’ve got to be compliant. If you’re prescribed medication, take it. If it causes intolerable side effects, tell your doctor. Maybe you can try another drug. Counseling helps more than you might think, but you’ve got to participate. Treatment may take time to work, but if you comply, you’ll likely feel better and function fully.